Mashiki (Japan) (AFP) – Rescuers searched through rubble for possible survivors Friday after a powerful earthquake in southern Japan left at least nine people dead and hundreds injured, though officials said the toll was unlikely to rise dramatically. Tens of thousands of people fled their homes after the 6.5-magnitude quake struck the southwestern island of Kyushu on Thursday night, leaving lumps of broken concrete strewn in the streets. Houses collapsed, factories stopped work and a high-speed train was derailed, while the roof of the treasured Kumamoto castle in the southern city of the same name was also damaged. “The house shook up and down,” said Nobuyuki Morita, 67, a resident of the worst hit town of Mashiki in Kumamoto prefecture, adding that he was watching TV at home when the quake struck. He and his wife spent the night in their car as the roof of their house had collapsed and furniture toppled over. Dozens of aftershocks followed the quake, which hit about 9:26 pm (1226 GMT) on Thursday evening, and officials warned the death toll could rise as rescuers scoured the collapsed structures. 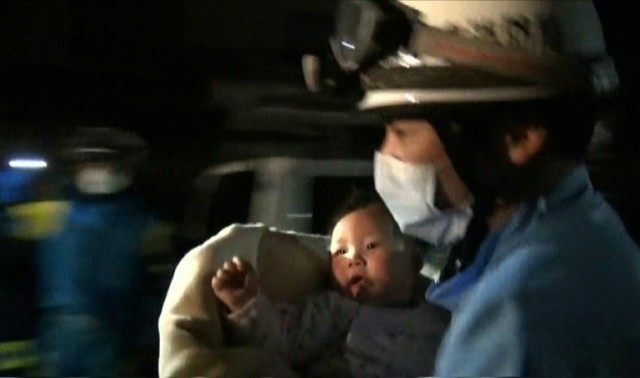 As rescue workers toiled through the night, an eight-month-old baby girl was pulled from the rubble alive and unharmed. “As far as we can tell from infrared images from a police helicopter, there appears to be a significant number of houses destroyed or half-collapsed,” said disaster minister Taro Kono. Rescuers were concentrating their searches in Mashiki, near the epicentre of the quake where eight of the nine deaths occurred. On the streets, the remains of collapsed Japanese-style houses — many of then aged, wooden structures — could be seen, and damaged roof tiles lay in piles. A rescue team with several search dogs patrolled around half-collapsed houses in the town but no new deaths have been announced for more than 11 hours. Scores of people spent the night huddled in front of Mashiki’s town hall, some in tears, while others wrapped themselves in blankets to ward off the nighttime chill. By Friday afternoon, the government said it had confirmed that 881 people were injured, at least 52 seriously. An official from the local Kumamoto disaster agency said at least nine were dead. But Chief Cabinet Secretary Yoshihide Suga said at a regular press conference that the death toll was unlikely to sharply increase, but that search operations were continuing just to make sure. He added that Prime Minister Shinzo Abe plans to visit Kumamoto on Saturday to meet victims. Gen Aoki, a Japan Meteorological Agency seismologist, urged residents to be on guard for more aftershocks and warned rain in coming days could make the situation worse. About 24,900 households in Kumamoto prefecture have been left without water, according to the government, a big improvement from an earlier figure of about 57,000. Nuclear plants in the region were unaffected, but several major manufacturers including Honda, Bridgestone, and Sony said they had suspended operations at factories in the area. Train services on Kyushu were temporarily halted after the earthquake and a super fast bullet train derailed — luckily while it was empty — said Yusuke Nanri, a spokesman for operator JR Kyushu. Bullet train services, however, remained suspended, JR said on its website. Some 1,600 military personnel were joined by nearly 2,000 police officers and more than 1,300 firefighters to help in the search and rescue efforts, Suga said. The initial quake, which struck at a shallow depth of 10 kilometres (6.2 miles), was followed two and a half hours later by another measuring 6.4 magnitude, according to Japan’s meteorological agency. The US Geological Survey measured it a lower 6.2 magnitude. In total, more than 130 tremors rocked the region after the first one hit, and officials warned this could continue for a week or so. Japan, one of the most seismically active countries in the world, suffered a massive undersea quake on March 11, 2011 that sent a tsunami barrelling into the country’s northeast coast. Some 18,500 people were left dead or missing, and several nuclear reactors went into meltdown at the Fukushima plant in the worst atomic accident in a generation.